I’m experiencing some major technical issues with my blog right now – on my computer, mine looks like the first primitive website ever created (or the website I built once for a homework assignment…), and also issues with viewing other people’s (WordPress) blogs which is why I haven’t been making the rounds lately. So far WordPress Support has not been able to help. I’m using my iPad to type this… Keeping my freak-out level as low as I can, but to say I’m feeling frustrated is an understatment, especially in light of the upcoming Virtual Vegan Potluck. Luckily, the VVP site seems to be okay. UPDATE: Todd just emailed me and asked me to offer to everyone a 20% discount on items purchased from the Sprouting Seeds and Sprouting Supplies categories at Todd’s Seeds. Just plug in offer vegan at checkout. One discount per person, good through the end of the year. Thanks, Todd! Just for fun, here’s some wheatgrass – from start to maturity – also from Todd’s Seeds. And now it’s time to win some seeds! They all look beautiful! I’m really sorry to hear about your WP problems, that sounds immensely frustrating and I hope it fixes itself very soon. Your blog looks totally normal to me, how weird. I know…I’m about ready to switch, but to what?! Also hope your problems fix up soon! Sorry to hear about your blog issues! That’s always so stressful, and the timing is never good! At times like those, I always wish technology was like a person I could just talk to and reason with instead of having to figure out its language and the underlying problem. Right!! Why don’t computers know my language ;-)?! I absolutely love sprouting my own seeds and legumes! They are all so crisp and refreshing, not to mention super nutritious! Hope you get things fixed! Thanks! Me, too! Thanks for entering the giveaway! I can figure out very basic stuff, but this is way beyond my skills. Thank goodness for my iPad – it’s the only way I can access my blog! I KNOW you’re entering this one ;-)! Super frustrated right now. I’m dead in the water; can’t even access my admin pages. Pssst: it’s fixed!! There was a problem w/ the Gateway IP address – a DNS issue. Crazy! Good to hear it got fixed. It always blows when sites go down…but thankfully it is usually ok in the end. A huge relief. And (as is usually the case) it was a very simple fix. The difficult part was figuring out what was wrong. This sounds like an exciting give away. Todd’s is a super company and if you love sprouts, this is the giveaway to enter. 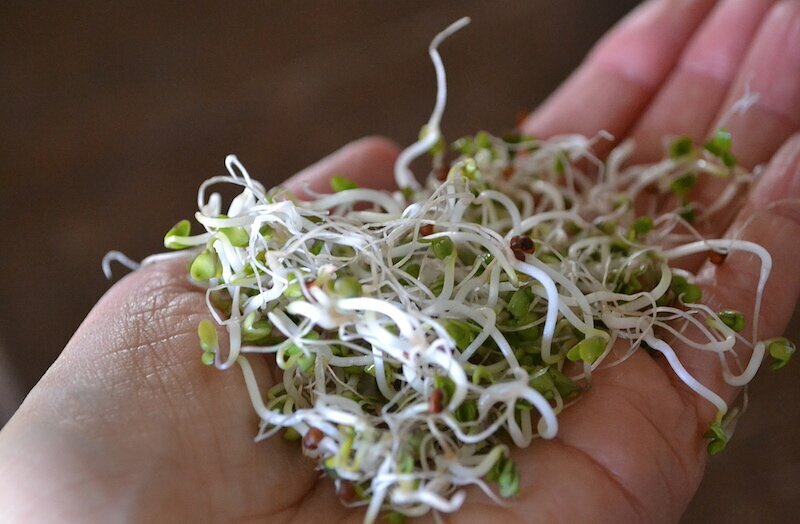 Today’s must do – Begin Sprouts! I’ve been wanting to find a site that sells seeds for this purpose and I’m so glad I found this! Sprouts in the store are overpriced and it’s just so easy and fun to make at home. Excited about this! That’s great, Maria! I’ve never had a failure with these seeds. They sprout fast and grow beautifully. Your site looks ok to me, I hope you get things worked out!! The only sprout on here that I have actually grown was wheatgrass!! LOVE it! Had planned to research how to sprout in a jar. You have saved me a lot of time. This is just what I was lookng for…..Seeds from you would be most helpful. There’s really nothing to it! Thanks for entering the giveaway! Blogger is awful! I had/have a blog with them and I found it very cumbersome. Thankfully, my computer woes are over! I’m back in bizness! Excellent! By the way Annie…I know you are REALLY busy but did I manage to actually sign up for Vegan Potluck this year? I filled in a form but am not sure if I am registered? Not too busy for you, luv! You are all signed up :-)! Nah…I am just type A Annie ;). I also have a fully qualified accountant son who had to have gotten it from somewhere (read list maker extraordinaire! 😉 ). Couldn’t be having anything less than my best work for something as important as this event. I am SO excited to be included in the same breath as some of my vegan food heroes and you and Somer are right up there at the top :). That’s impressive, Treesa! I’ve never heard of grinding the seeds! I wish you the best with your health. It sounds as if you are taking care of yourself and I totally agree with you that food is the key. Best of luck winning the giveaway! Broccoli sprouts are the new kale :-)! I LOVE broccoli sprouts! I eat them on my veggie burgers all the time. Oh yeah- that’s a great way to eat them! i’ve never sprouted broccoli.. everything else, yes.. loads of beans, lentils, peas! You’re way ahead of me on sprouting…still a novice over here!